Dr. Fahmy completed his higher surgical training in the United Kingdom after he obtained his Fellowship of the Royal College of Surgeons of Glasgow and Mch (Orth.) from Dundee Medical School in Scotland in 1996. In 2016, he was awarded the honorary Fellowship from Royal College of Surgeons of England. He is also a fellow of the American Academy of Orthopaedic Surgeons (AAOS), which is the biggest Orthopaedic Academy in the world and fellow of International Group for Advancement of Spinal Science (IGASS). Dr. Fahmy is an Examiner in the Royal College of Surgeon of England, UK, and the educational supervisor through most of his previous posts overseeing the Continuous Medical Education programs (CME) in his department. He has been organizing and participating in medical student and junior doctors training in most of his previous posts. Dr. Mohamed Fahmy is a Senior Orthopaedic Surgeon with special expertise in Joint Arthroplasty practically complex bilateral knee deformity and Arthroscopic surgery of the knee. His main skills is in the field of Joint replacement, primary and revision especially Knee, hip and Shoulder. 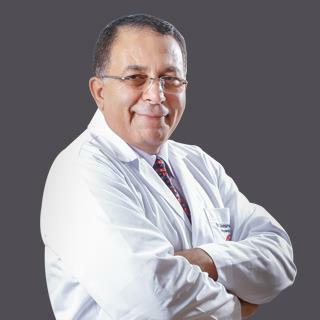 Dr. Fahmy has over 30 years experience in Knee and Shoulder Arthroscopic surgery practically anterior cruciate ligament reconstruction, knee cartilage repair, all different types of difficult fractures practically around shoulder, elbow, knee, hip and ankle. Dr. Fahmy presented his work of bilateral simultaneous knee Arthroplasty (Replacing both knee joint at the same time) in patients with complex knee deformity and difficulty walking, at international conferences. Dr. Fahmy speaks Arabic and English. Joint Arthroplasty practically complex bilateral knee deformity and Arthroscopic surgery of the knee. Joint replacement, primary and revision especially Knee, hip and Shoulder. Fellowship of the Royal College of Surgeons of Glasgow and Mch (Orth. ), 1996. Fellowship from Royal College of Surgeons of England. Fellow of the American Academy of Orthopaedic Surgeons (AAOS). Fellow of International Group for Advancement of Spinal Science (IGASS).